MIAMI (October 29, 2016) - Nina Johnson is pleased to announce I Was Going to Call It Your Name But You Didn’t Let Me, Awol Erizku’s first solo exhibition at the gallery. Presenting a group of 20 paintings alongside a conceptual sound collage of music and sonic ephemera, Erizku traffics in the space between sound and sight. The paintings bear the same subject matter: a disembodied hand, poised and manicured, holding a rose—not taking it or giving it, but only holding it. 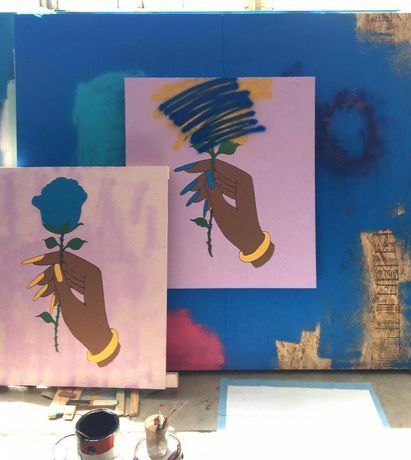 Appropriated from nail salon signage in Los Angeles, where the artist keeps a studio, the hand is both localized and ubiquitous, appearing across the country in interchangeable locales, signifying a variety of ethnicities and communities. Not only is it the first time Erizku has introduced figuration into his practice, it references his repeated use of floral imagery across his multi-disciplinary practice. Accompanying these works is a mix of pop songs and sound bites from a variety of media, often pulled from Youtube and Soundcloud. This shifting composition teases out different emotions from the paintings, each of which is named after the song playing in the studio when it was completed. The tension between the iterative paintings—each unique, yet similar to the rest—and the unifying force of the music flowing throughout the gallery echoes the experience of listening to music—everyone hears the same song in a completely new way.